The March 2016 LET results have been released by the Professional Regulation Commission (PRC) on Thursday, May 19, 2016. According to the PRC, a total of 12,128 out of 42,739 examinees (28.38%) successfully passed in the elementary level, while 18,810 out of 53,090 examinees (35.43%) successfully passed in the secondary level. 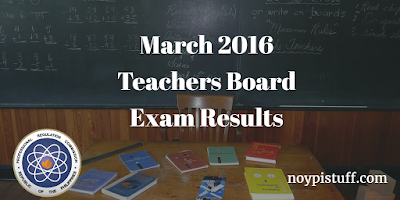 The Licensure Examination for Teachers, otherwise known as the Teachers Board Exam, was given last March 20, 2016 in various testing centers across the country. The PRC said online registration for the issuance of Professional Identification Card (ID) and Certificate of Registration will take place on May 30 - June 2, 2016 (Elementary) and June 3 - June 10, 2016 (Secondary). The dates and venues for the oathtaking ceremonies of the new successful LET exam takers are yet to be announced.